On 25 March, we begin the second sequence of 10 intense GAP days in 2014, with the focus this time being on deeper alignment with the masculine force of expression. Appropriately, the timing of this is shortly after equinox and we are emerging into the 'Light' and exuberance of Spring and Summer. It is our time to focus on transforming our 'external' or sacred masculine expression and infusing it with a restored vitality and joy. It is the wisdom and magic of the divine feminine brought into action with a new lightness. A genuine happiness that results from a greater wholeness within our psyche. Many of us have spent years undoing and healing layers upon layers of trauma, healing wounds and doing our 'inner work' and have experienced lengthy periods of exhaustion and often joylessness.Traversing the shadow realms of the psyche takes us on a hero's journey of trials to be overcome, however the reclamation of our vital life force through the integrity of our sovereignty is now at hand. Our Diamond alignment for these GAP days will enhance the natural flow of vitality, beauty and happiness through your cellular matrix and infuse your life with freshness. 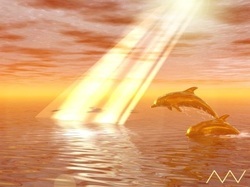 This truly is our time as the newly delivered planetary energies become integrated and available through our biology. Take a deep breath and join us for a revitalising, catalytic energy process!